In Uganda we plant coffee seeds in large beds and in shaded nurseries usually together with banana trees. After long hours of watering and keeping these seedlings in suitable shade, they are moved and planted permanently in an area where they will eventually grow into coffee trees. This process takes place during the wet season while the soil is rich with moisture. 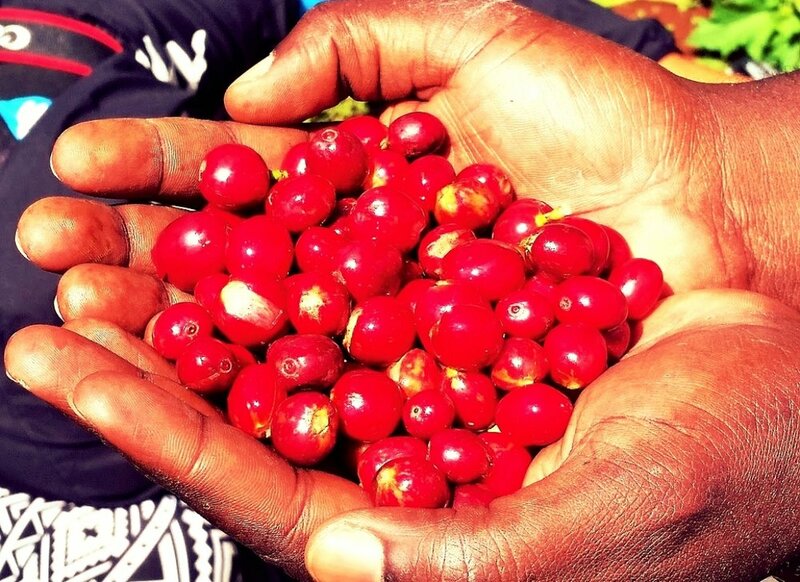 When harvesting coffee, the farmer is looking for a ripe cherry, which is typically a bright deep red cherry bean. We have multiple harvest seasons in Uganda and the first big one is called the main harvest followed by smaller ones we call the fly crop. The harvest seasons depend on the region and the type of coffee being harvested, as we have Robusta and Arabica flowering at different times, making Uganda a country that can harvest coffee year round. Handpicked: Only the ripe cherries are harvested and handpicked. These coffee pickers work long hours around the clock, moving from one tree to the next over a two week period to find the most ripened cherries. We process our coffee using two methods namely; the wet method and dry method. During the Dry Method, the fresh cherries are spread out on a large tarp and dried in the sun. Farmers rake the cherries on a frequent basis to ensure that the coffee can dries evenly. With the Wet Method, coffee has this coat called the pulp which is removed and into parchment. Next, the coffee beans are placed in water whereas, the lighter beans float while the heavier beans sink to the bottom. Then these beans are taken to be fermented for a period of 48 hours where the parchment is dissolved naturally. The coffee is washed once again and dried to reach the desired moisture content. We Hull the beans to remove the coffee husks. The beans are then graded and color sorted. This process is done by size and weight on a gravity table where the heavier beans go on one side and lighter beans go on another. We value consistency in color so we use a color sorter which places same colored beans in the batch. Based on the feedback we receive from the cupping table and from our customers,these milled beans are placed into jute and in grainpro bags to maintain the moisture content, loaded onto a container driven to the port in Mombasa and loaded onto a ship to Long Beach CA.